Calibration Cards expire after 2 years from the date of issue. Calibration is important for industry standard compliance. If your calibration card is expired, contact Cognex for purchasing information. Note that for 2D verifiers (such as a TruCheck Optima or TruCheck Omni), you can choose either a “2D Calibration Card” or a “Linear Calibration Card”. Either of them will allow you to calibrate the reflectance levels which is what calibration does. Importantly, calibration is not specific to the symbology and once the verifier is calibrated using either type of calibration target, the verifier is calibrated for both 1D and 2D barcodes. However, for 1D verifiers, such as TruCheck Laser USB which do not work on 2D barcodes, only a “1D Calibration barcode” can be used. 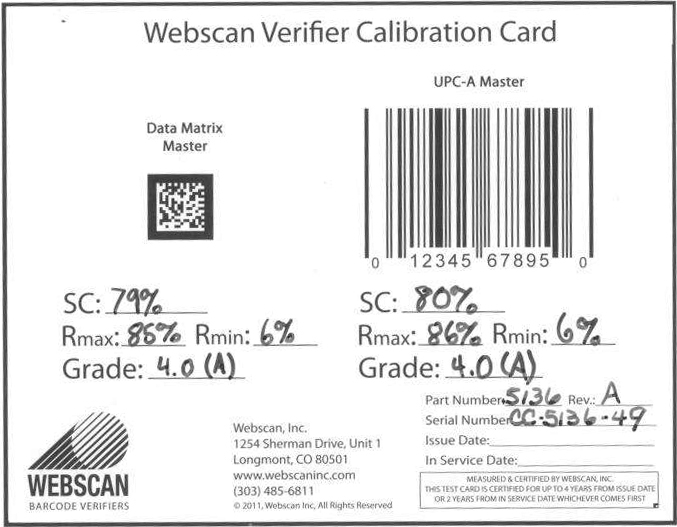 The Webscan Calibration Card (part number DMV-WCC below) contains both types of calibration target symbols and can be used to calibrate either type of verifier. The calibration target symbols on the Webscan Calibration Card are “Master” Symbols, similar to the master symbols on the GS1 UPC/EAN Card and GS1 Data Matrix Card. The Webscan Calibration Card can be used to calibrate and check your calibration values (Rmax and Rmin). Besides Calibration, many of the calibration target cards below can also be used for “Conformance Testing”. Conformance Test Symbols are barcodes produced with intentional defects that give lower than perfect grades. The GS1 Data Matrix calibration card contains Data Matrix symbols with intentional imperfections that you can measure with the verifier to check the reporting capabilities of the verifier and to document conformance to industry standards such as ISO/IEC 15415 and ISO/IEC 15426-2 and GS1 specifications. The GS1 UPC/EAN Card contains UPC/EAN symbols that contain intentional imperfections that you can measure with the verifier to check the reporting capabilities of the verifier and to document conformance to industry standards such as ISO/IEC 15416. Other industry standard calibration cards (shown below) with linear barcode conformance tests are available. The Webscan calibration card contains Master Grade Symbols only and does not contain intentionally produced “Conformance Test Symbols” with low grades. To order a new calibration card, please call us at (855) 426-4639 or e-mail us at verifiers@cognex.com. Currently, all 1D (Linear) GS1 calibration cards are out of stock and discontinued. Webscan Calibration Card. Contains a Master (nearly perfect) Data Matrix symbol and a Master (nearly perfect) UPC-A symbol. This card can be used to calibrate any Webscan barcode verifier, both 1D, and 2D (except a 20 MIL aperture Laser verifier). Conformance test symbols are not incorporated into this card, however. For that, you must use one or more of the GS1 cards shown above. Applied Image #AI-CCS-UPC/EAN 6mil UPC/EAN Calibrated Conformance Standard Test Card. (This is most similar to discontinue item #1556 (GS1 EAN/UPC Calibration Card).